The Stage is set and it is finally here, the Koko Master D’Banj has short-listed his top 5 finalists from his “The King Is Here” rap competition, in early August D’Banj announced that he would be running “The King Is Here” rap competition which has so far received a lot of followership, the competition is slowly running to a conclusion as D’Banj gears up to announce the winner. Months after announcing “The King Is Here” rap competition, D’Banj the Koko Master has searched through over 8,000 entries and he has found the best of the best. After a gruelling task of listening and analysing to look for who would eventually emerge as the winner of “The King Is Here” rap competition, D’Banj short-listed over eight thousand entries to five finalists and the eventual winner will be decided by popular opinion. Fans and critics will be needed to decide this one. Everybody will be given an opportunity to hear the top 5 songs short-listed by D’Banj and you can now decide who you feel deserves to feature on the remix of “The King Is Here” with D’Banj and Reminisce. Be warned you will be listening to some of the sickest and hardest flowing bars from raw and upcoming talents. 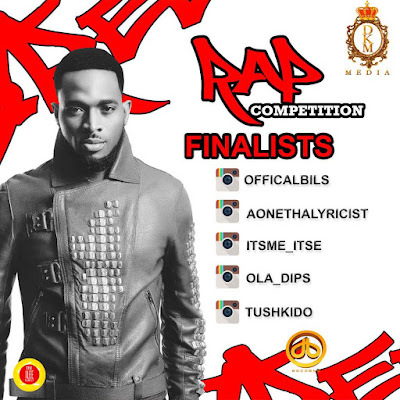 You can vote for your preferred finalist by clicking on their instagram page and liking their photos that will be reposted on D'Banj's page, the finalist with the most likes will be announced as the winner by D’Banj himself. D’Banj who is currently on tour in Australia is gearing up to release his first of it’s kind Visual EP titled “An Epic Journey”. Did you know you can shorten your long urls with Shortest and make $$$$$$ for every click on your short urls.